We are interested in visual system function, with a strong emphasis on the mammalian retina. Our work has two major focus areas. First, we study the healthy retina, and explore structure and connectivity of retinal circuits that allow complex imaging computations to be performed. Second, we use the retinas of animals affected by blindness to explore novel genetic tools to restore the function of the retina after retinal degeneration. Recently, we started to explore the same questions with human retina, which we obtain through a collaboration with the University Eye Hospital in Tübingen. 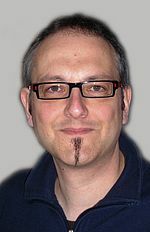 Our group is also member of the Bernstein Center for Computational Neuroscience Tübingen. In retinal degeneration, the gradual death of photoreceptors leads to blindness. There is no known treatment. We investigate optogenetic tools to restore visual function. We express genetically encoded optical neuromodulators (e.g. channelrhodopsin or halorhodopsin) in the remaining retinal neurons of degenerate retina. We quantify the success of vision restoration on the level of retinal morphology and physiology, and on the behavioral level of the animals treated. Our main focus is on the optimization of the optogenetic treatment strategy for different inherited forms of retinal degeneration. The retina functions over light intensities spanning 14 orders of magnitude. We are interested in how the function of individual retinal circuits changes (or doesn't change) with the change of the ambient light level. Fig. 1. Latency of ganglion cell responses as a function of ambient light level. Ganglion cells have the lowest latency at low photopic light levels. At higher and lower light levels, the latency is longer. To obtain these results, we measured ganglion cell responses of isolated mouse retina with the help of multi-electrode arrays (MEAs). During the experiment, the ambient light level was increased 10-fold every 40 minutes by changing a neutral density (ND) filter in the light path. The visual stimulus was a full-field white noise flicker. We calculated the temporal linear filters of the ganglion cells in response to this stimulus, and measured the time-to-first-peak. α2δ is an accessory subunit of voltage-gated calcium channels. Mutations of these proteins lead to retinal degeneration in mice and humans. We study the role of these proteins in the retina, and investigate how the mutations cause the disease phenotype. Such mutations also lead to defects in the auditory system. We therefore collaborate closely with Prof. Marlies Knipper (Hearing Research Center, Tübingen) and Prof. Jutta Engel (Saarland University), who study the function of α2δ in the auditory system. Most of our knowledge on retinal function has been learned from animal models. Not much is known about the function of the human retina on the level of individual cells and circuits. We collaborate with the University Eye Hospital Tübingen to study the function of human retina in vitro. Fig. 2. 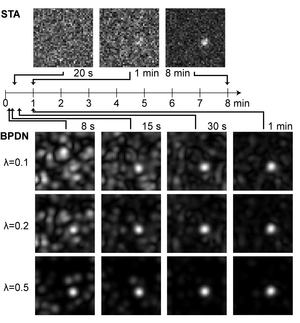 Spiking responses of a human retinal ganglion cell in response full-field flashes. Top: Timing of the light stimulus. Middle: Each tick is a single spike, the 88 rows represent the responses of the ganglion cell to 88 repetitions of the same stimulus. Bottom: Average spike rate. In collaboration with Al Molnar (Cornell University) we develop new computational tools for the study of human retina. We apply methods from the field of compressed sensing to spike sorting, receptive field reconstruction, and visual scene reconstruction. Fig. 3. Receptive field reconstruction using new computational methods. We presented an 8-minute long checkerboard-like stimulus to the retina. For each checker, every 33 ms, we updated the grayscale intensity randomly from a Gaussian distribution. From the spiking responses of a ganglion cell, we calculated its receptive field either by the classical spike-triggered-average (STA) method (top), or with our newly developed algorithm (basis pursuit denoising, BPDN, bottom). To calculate the receptive field, we used only a subset of the recorded data, as indicated by the timeline. The classical STA method requires many minutes of data to get a reasonable estimate of the receptive field. 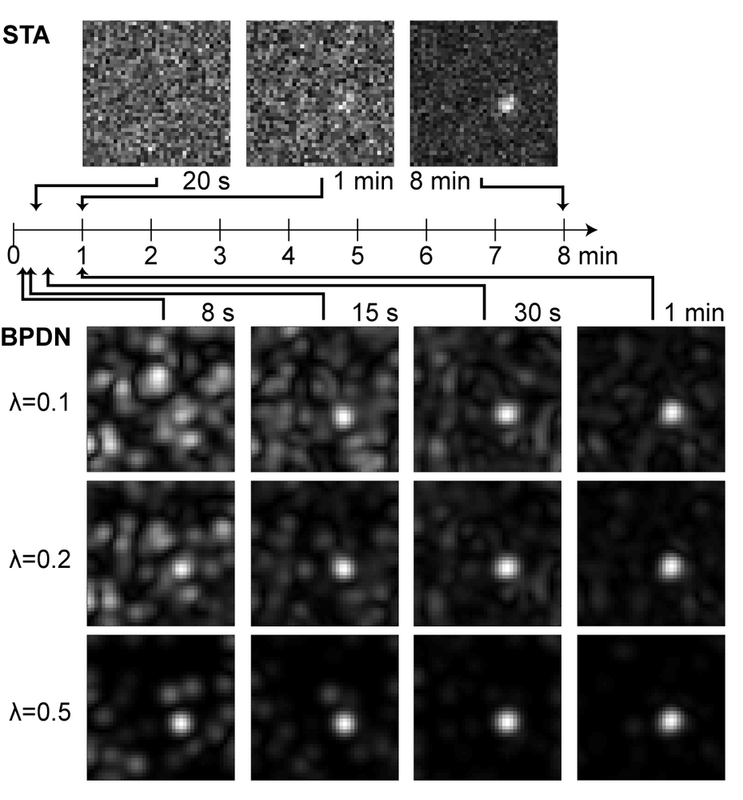 The BPDN method requires only a few seconds of data. The parameter lambda determines the sparseness of the calculated receptive field. Our methodologies span a wide range covering molecular biology, genetics, electrophysiology, 2-photon functional and morphological imaging, histology, computational modelling, and behavioral experiments.